We also have available bulls suitable for serving heifers and younger bulls for the future, in fact something to suit everyone. The Babs family is synonomous with great longevity and wearing cattle. Sorry he's now sold 4/11/17 Sired by DG Hartley and from Aintree Iota Wendy LP60, SP, EX94-3E with yields to over 12,000kg at 4.66% fat and 3.09% protein. backed by 5 gens of the true British family the Wendys, which carry nine generations of Aintree breeding. Another great from the Shower family. 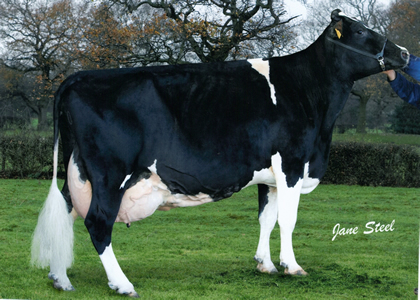 his dam is the VG86 Goodwhone Secret, who completes 11 gens VG or EX. Now in her 2nd her 1st lact was 8080kg at 4.49% fat and 3.39% protein.